Travellers visit Cancun primarily due to the wide range of opportunities that this place provides in terms of communion with nature. However, after your escapades with all the forms of nature, there are places that offer modern recreational facilities. 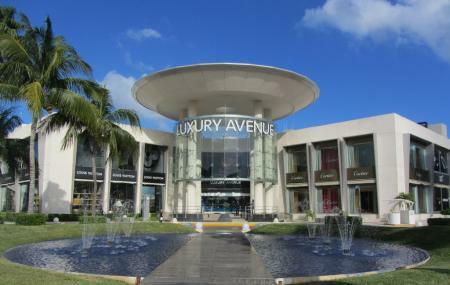 One such place is Kukulcan Plaza, a shopping center that houses an extensive range of shopping like crafts, internationally renowned boutiques, jewelry stores carrying the finest designer pieces, and elegant perfume shops. Within this shopping space, there is some kind of recreational opportunity for every age group. So while you might feel hungry during your shopping spree, there are also a variety of restaurants located on the lagoon that offer quality time with impressive terraces in a beautiful setting. How popular is Kukulcan Plaza? People normally club together El Parque De Las Palapas and Iglesia De Cristo Rey while planning their visit to Kukulcan Plaza. People also prefer to end their day with Kukulcan Plaza. WHAT?! only 4 stars?? Well, it's not finished and there's quite a bit of construction going on, so yeah, 4 stars. The cool thing is it's a nice little getaway inside your getaway and if you're American (which I am) you kinda like the feel of some home town shopping. It's air conditioned, there a grocery store in the middle of it with goods that are a little less expensive than your hotel, there's gift shops so you can over pay for your trinkets in a mall rather than getting from some guy on the beach. We walked here from our hotel which I would recommend as parking is limited. Great place for us to look for souvenirs and with the Soriano supermarket, it definitely makes stocking the villa a lot easier. We enjoy walking through the High End shops and just window shopping. Great place to spend part of a rainy day too. Went to Solaris supermarket and found it just what we needed for quick additions to our pantry at the Royal Sands. The Deli staff were very helpful. The Mall is under construction and may be quite a different place when done. The mall is undergoing extensive renovation but there are many stores open and ready to do business, and there is a wide variety of stores. There is a pharmacy, several clothing stores including one intimate apparel shop, gift and souvenir shop and several places to try and buy tequila and other spirits. There is an area of several high end goods for those looking for the finer things. Parking is available below the mall and a bus stop nearly in front of the mall.